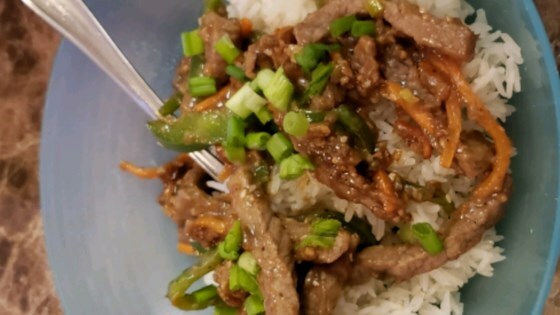 "A simple but spicy dish with beef, carrots and green onions. Serve over rice for a very filling meal." Heat 1 tablespoon of oil in a wok or skillet over high heat. Cook and stir beef in hot oil for 1 minute; remove, and set aside. Heat remaining tablespoon of oil in the same pan. Saute carrots and white part of green onions for 2 minutes. Stir in green parts of the green onion, and saute for 1 minute. Stir in sesame seed mixture and beef. Cook and stir until sauce boils and thickens. Fabulous! I added more red pepper, only because we like spicey - I also added honey to even out the saltiness of the soy sauce. Ginger, garlic and sesame oil compliment well, too. Everyone thought this was excellent. Think I will double the sauce part next time..like more juice for our noodles! Great blend of flavors..we like spicy food and this could have been spicier.